Take this a a collection of patterns, put together, it is not supposed to look nice as a whole. Staying with quads, you can try before looking at the answer, or a more sophisticated one: and its solution. 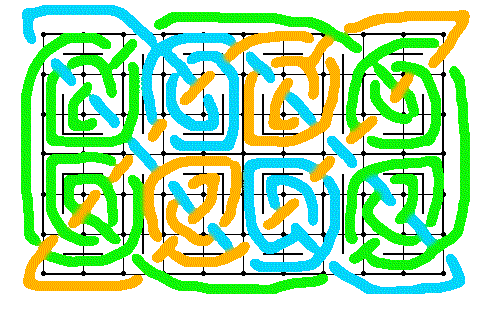 Do the same exercice on a triangular lattice and try to discover new patterns that you like. You are going to learn how to use them in a bigger picture. The key notion is encapsulation. But first try and understand how to extract a graph from a knot. Hi, Have really enjoyed this short course and picked it up quickly. However theree appears to be no support/answers for the triangular lattices? Is this an ommision or...? Thanks for your message. It was because I am lazy and overworked :-) They are now on the Answers page. Enjoy! I don’t know if you are still keeping this WONDERFUL tutorial current, but the answers to the triangle lattices are not on the Answers page. Could you please put them up again? Thank you so much. Question: is there a function of points and segments that will tell you how many strings you will have in a design? Thanks for your post. I am not updating things as much as I would like to. Ok, I didn’t get what was missing, the triangular ones. I’ll do it when I find a few minutes nearby my tabletPC (too long to do it with the mouse). As for the number of threads, I have done this page but it’s in French. To make a long story short, the number of threads in a rectangular plate is the greatest common divisor of the width and the height. For example 6x9 will give you 3 threads because 6=3x2 and 9=3x3, the common divisor is 3. Put a wall where 2 different threads cross to merge them into one. 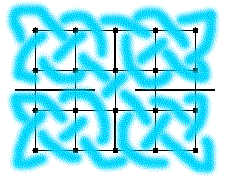 Change a wall between 2 different threads will merge them into one, whether you flip the wall or you change it into a crossing. 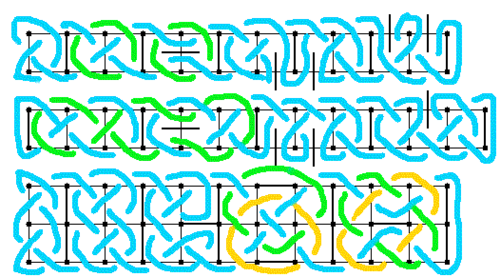 When one thread is self-crossing, one of the two types of wall will split it into two threads. This way, with little tweaks here and there, you can achieve whichever number of threads you want. Wish I’d paid more attention in French class, 30 years ago...Dieu merci pour Dictionary.com & Google traducteurs. Pas parfait, mais à proximité. Merci encore. PS. I’ll send you a picture of my 1st project soon. Dude, right on there btorehr.